On December 22, 2016, the U.S. and Japanese governments jointly held a ceremony in Nago City, Okinawa to mark the return of 4.000 hectares of the U.S. military’s Northern Training Area in northern Okinawa Island to Japan. Both governments tried to promote the event as celebratory as possible (see the U.S. Embassy website). However, the ceremony was an awkward and blundering event in the sense that no one seemed to be in mood for real celebration (see The New York Times and Truthout). The return of land is certainly a positive development for Okinawa. Many in Okinawa were however not celebrating because the land return deal was contingent upon the construction of six new helipads next to the community of Takae in Hagashi village. They were angry that the Japanese government took an iron hand approach to finish the construction in time for the ceremony by oppressing and arresting protesters (see The Japan Times). Okinawa Governor Takeshi Onaga, along with many prefectural assembly members and national diet members from Okinawa, did not attend the ceremony, declining the Japanese government’s invitation (see Governor Onaga's letter declining the government's invitation). 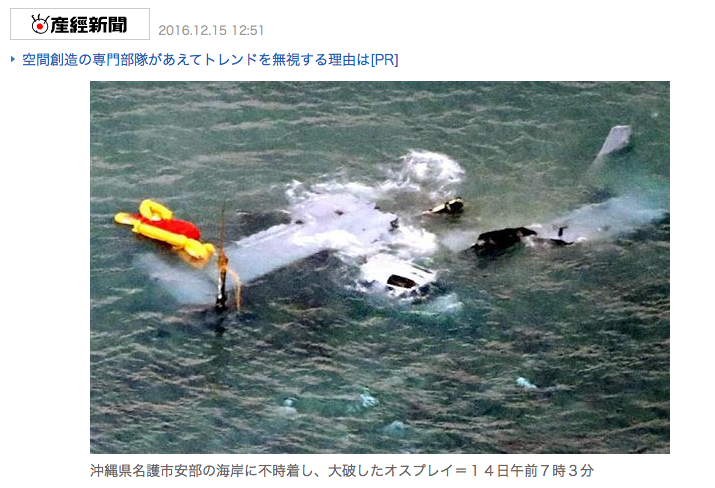 Governor Onaga was outraged because not only a U.S. military MV-22 Osprey crashed in the coastal area of Abu, Nago city on December 13 (see BBC News). But also because the U.S. military resumed the operations of MV-22 Osprey on December 19, ignoring Onaga’s plea to halt their operations until the U.S. military's investigation over the crash is complete (see Governor Onaga's statement). Instead of attending the governments' land return ceremony, Governor Onaga joined a protest rally held in Nago city, condemning the crash and demanding the removal of the MV-22 Osprey from Okinawa. Of course, the U.S. and Japanese governments were irritated about many people in Okinawa not appreciating the return of land and Governor Onaga not showing up for the ceremony. 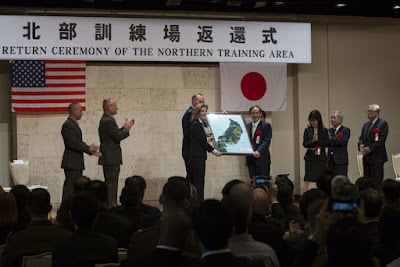 Chief Cabinet Secretary Yoshihide Suga said "it was extremely deplorable that the governor who has called for reduction of the military presence did not attend the ceremony" (see Stars and Stripes). At the same time, it is easily assumed that both governments were vexed. 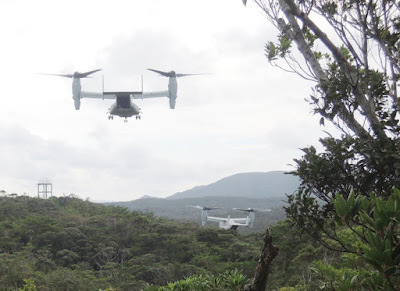 The crash of a MV-22 ruined this important opportunity for the governments to legitimize their 1996 SACO agreement, which stipulates the construction of helipads in the Yanbaru forest and of a new U.S. air base in Henoko and Oura Bay, Nago city. Many in Okinawa have come to see the SACO agreement as oppressive. The U.S. military itself was probably frustrated as well. 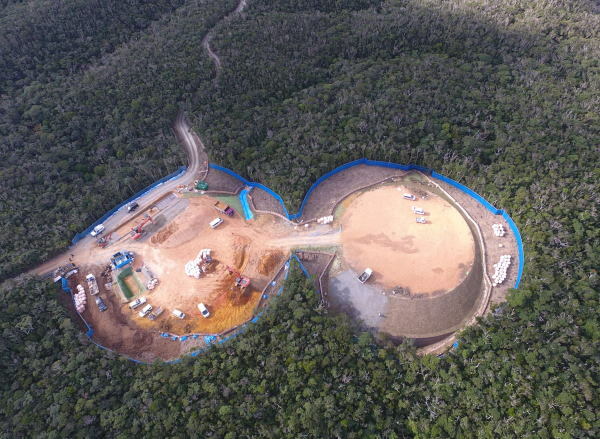 Not only that it has lost 4, 000 hectares of its training area. 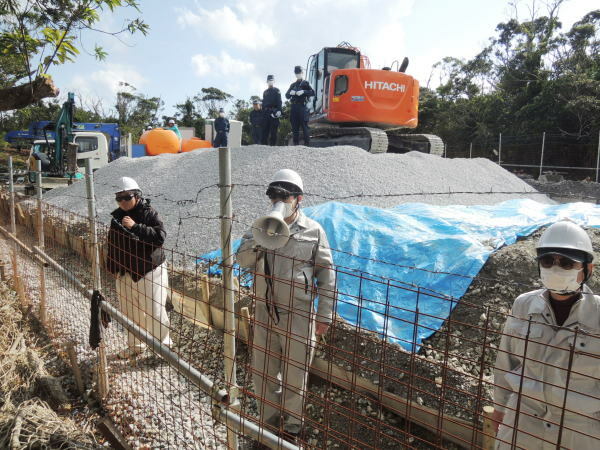 But also some of the helipads, declared “complete” by the Japanese government in time for the ceremony, appeared not to be so (see Choi san no okinawa nikki and Tokyo Shimbun/TOKYO web). In fact, there has been no official word from the U.S. military regarding the readiness and safety of the helipads for use. The use of the incomplete helipads by MV-22 could lead to another disastrous accident. Despite the Japanese government's declaration that the construction of all the helipads was now complete, construction work was still in process. All the anger, outrage, irritation and frustration surrounding the ceremony can be explained by this simple fact: too many U.S. military bases and facilities are still in Okinawa. 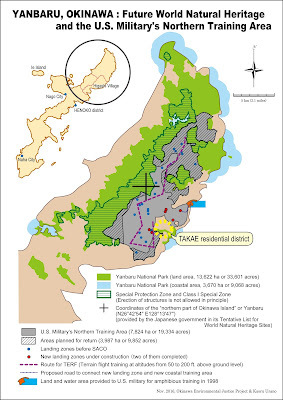 With the return of land to Japan and Okinawa, now 70 percent (down from 74%) of the U.S. military bases and facilities are still concentrated in Okinawa, which accounts for only 0.6% of Japan’s land mass. President-elect Donald Trump during his presidential election campaign insisted that Japan should shoulder its share of defense costs. It is time for the U.S. government and military to tell the Japanese government that "burden sharing" should be sought for not only in financial and strategic terms between countries, but also on the principles of democracy, equality, and justice between countries, regions and people within the countries. P.S. 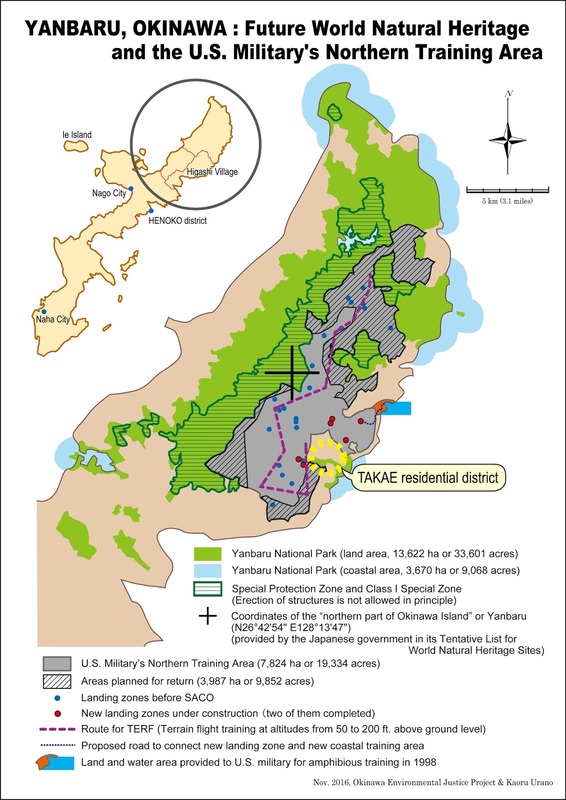 The U.S. military in Okinawa will face a difficult situation as the inscription process of the Yanbaru forest for World Natural Heritage moves on to the next stage in early next year (see NGOs' Letter of Concern and Request). 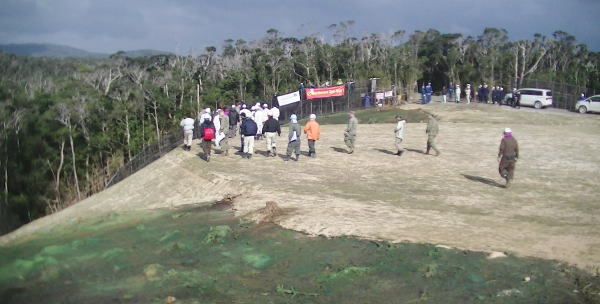 The presence of the U.S. military Northern Training Area in the forest should be a hot topic among the UNESCO's World Heritage committee as the construction of helipads and the conduct of U.S. military training in the forest could hinder the chances of success for the forest in its bid for recognition as a World Natural Heritage site.